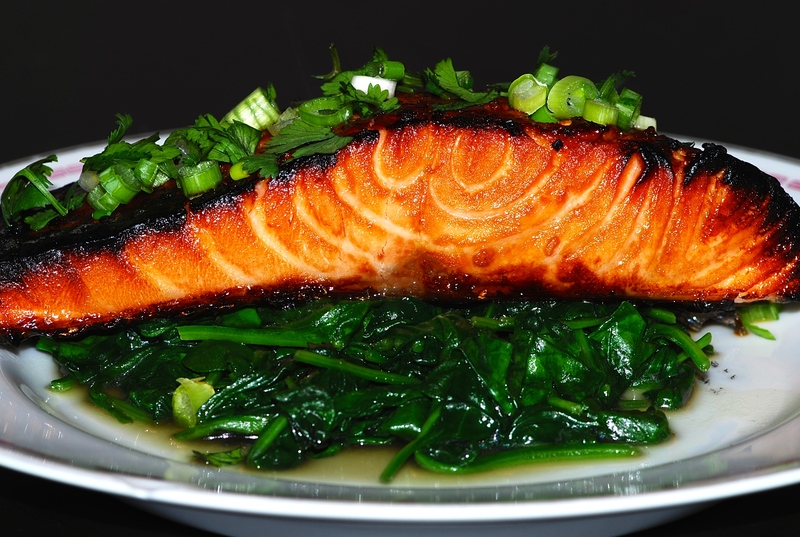 So thanks to this blog, I decided to cook something that I never do – cook salmon. Not because it is too difficult or anything, just for some reason I don’t cook salmon. I guess I would sum it us as cooked salmon isn’t my favorite fish, and it’s not something I would ever order. I usually only get it in sushi/sashimi form. But these are new days and new times, so I thought I would give it a try. So I mixed the first 8 ingredients in a bowl and then I poured it over the salmon filets in a bag to let it marinate. Let it marinate somewhere between 30 minutes and 2 hours. Place the salmon filets on an aluminum foiled baking pan and broil on high for about 8-10 minutes. Then I placed it on a bed of wilted spinach and garnished with finely chopped green onions and cilantro. The green onions and cilantro definitely added flavor to it, so its not solely for looks. In the end I was pretty pleased with myself and would definitely make it again (or shocker, maybe some other type of salmon…). It was also one of the healthier meals I prepared considering my other posts lol. Anyways, it was fun to venture out a bit and try something new and I am glad I did. I hope you enjoy it too! You are not only an accomplished Culinary God………..you are a Food Artist as well. Haha. Thank you! I wouldn’t consider myself any of that, just an aficionado. But Thanks!